“You’re catnip to a girl like me.” Hollywood hasn’t given us a Bruce and Selina with that kind of chemistry, before or since. 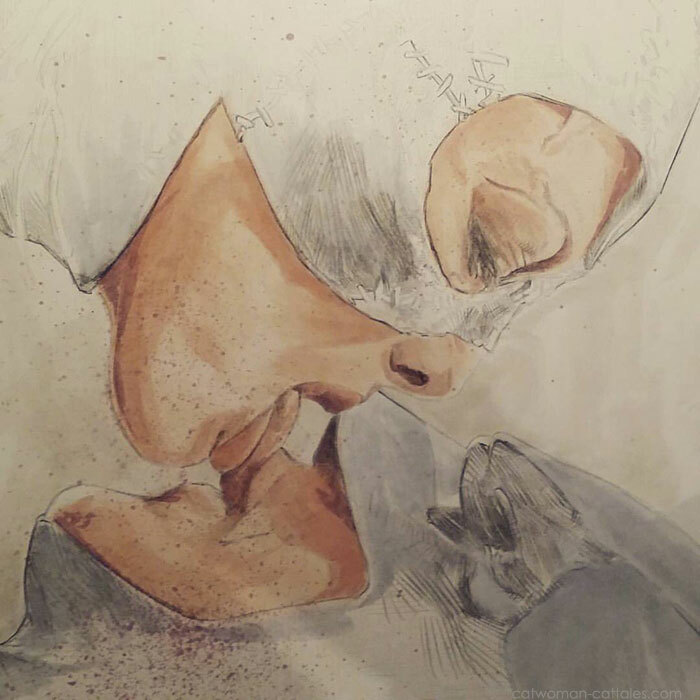 Inspired by the iconic rooftop encounter in Batman Returns, Romano Molenaar caught our eye sharing with this early sketch that, prior to the final colors, could still be our own Cat-Tales Catwoman, who has more than a little rooftop heat with Batman. (Let us know which story we should reference for rooftop, in costume Bat/Cat play: Cattitude, Napoleon’s Plan, something else? See the finished work, the breath-taking fully colored image Batman Returns: Kiss in One Shots: Hollywoodland. Visit Romano Nolenar’s Facebook Page to view more of his work. A full website coming soon.